I came up with this one on the fly last night. Since I’m heading to my 15-year high school reunion this weekend, I have a lot of packing & housework to get through. Not being a fan of either, I curled up on the couch with a cat and a good book instead. I realized a couple hours later that it was getting a bit late and should probably make something quick to eat. 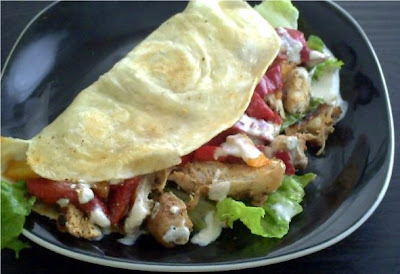 It started out very simply: just some quick grilled chicken wrapped up in a soft tortilla with some salsa on the side. Yummy, but not all that exciting. Then I remembered I had a little frozen pepper blend and figured I’d add some color & flavor to my lonely little chicken thigh. It went on from there and I ended up with a fun little soft taco that I thought would be fun to share. Though the peppers & chicken were plenty flavorful, I still wanted to add a little sauce to my tacos, and I thought a spicy, yet creamy sauce would be a fun addition. The addition of cumin & crushed red chilies gave the sauce some depth & smokiness that I felt went well with the rest of the ingredients. In fact, it would probably go well with shrimp (perhaps on the Black Bean, Shrimp & Corn burritos from last month) or fish, so keep this little recipe handy for other dishes. Other than that, there’s not much to note on this one! It’s a great dish for weeknight dinners because it’s quick and very simple to prepare. And if you don’t feel like grilling your chicken, this is also a good way to make use of some rotisserie chicken leftovers. Speaking of which, stay tuned for a delicious, easy way to make your own “rotisserie” style chicken that tastes way better than anything you’ll get from a store! But first – tacos! Combine the last 5 ingredients in a bowl and mix together well. Cover and set aside in the refrigerator until tacos are ready to serve. Heat the grill. Combine the sea salt, pepper, oregano, and ¼ t cumin in a small bowl and mix together. Sprinkle both sides of the chicken with the seasoning and grill until juicy but no longer pink inside. Allow to cool for a couple of minutes then cut into 1½” long strips. Heat the olive oil in a small sautee pan and add the bell pepper strips and just a dash of the remaining seasoning. Spray a medium skillet with cooking spray and heat over medium high heat. Place the tortillas in the skillet individually and heat for about 30-40 seconds on each side, or until they begin to puff up a little bit. To assemble your tacos, place a small handful of the chopped lettuce on one half of the tortilla. Add the chicken strips, followed by a bit of the sautéed bell peppers. Drizzle a bit of the creamy salsa on top, fold the other half of the tortilla over all the goodies, grab a couple napkins, and enjoy! I will be making these this weekend - they look yummy! I don't think I've ever heard of or seen Mexican oregano, though. Will regular oregano work or is there another substitute?